The Topps Series 1 2019 set of 350 cards is now part of the Baseball Card Cyber Museum. 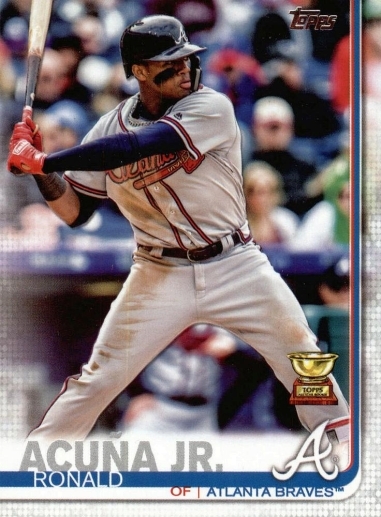 Topps 2019 once again features a full-bleed design, and unassuming card backs reminiscent of the sets from the past few years. 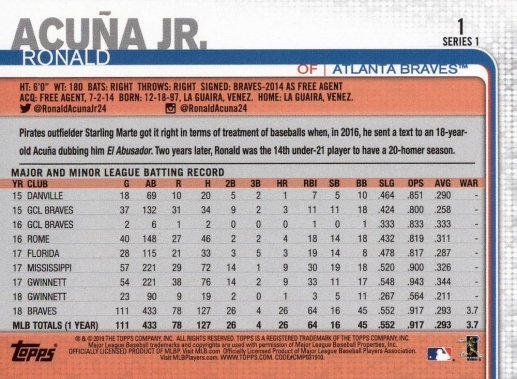 The Donruss 2019 set of 252 cards is now part of the Baseball Card Cyber Museum. The Topps Heritage 2019 set of 500 cards is now part of the Baseball Card Cyber Museum. The Topps Series 1 2019 set of 350 cards is now part of the Baseball Card Cyber Museum. The O-Pee-Chee Retro 2018-19 set of 600 cards is now part of the Hockey Card Cyber Museum. The Topps Holiday 2018 set of 200 cards is now part of the Baseball Card Cyber Museum.